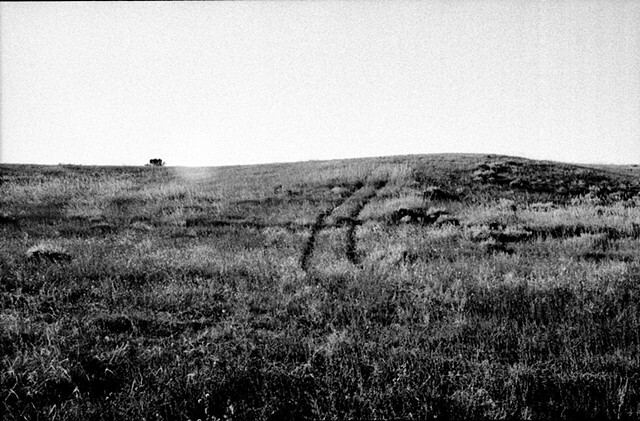 Using a hand-held 35mm camera loaded with black and white film, the resulting series of photographs are of high contrast and extreme grain. The texture of the image mirrors the terrain in which it was shot, a location within the three registers of the desert (Independence Rock, Names Hill, and Register Cliff), all in Wyoming and roughly halfway along the 2,700-mile Oregon trail and nearby Independence Rock. There is a fork in the road called the parting of the ways, where hundreds of thousands of emigrants, trappers and pioneers in the 1800s rested, headed from the plains to the West with the prospect of unimaginable wealth and a better life. There, the emigrants had to choose between a shorter path with no water and the threat of fatal dehydration, or a longer, more treacherous path where water was available, but the duration of the trip could prove fatal. The photographs serve as imagined points of view, reflecting the remoteness, foreignness of a place and an unknown future. To accompany the photographs, I made rubbings of the names carved into rocks, a record of those who passed and perhaps perished. 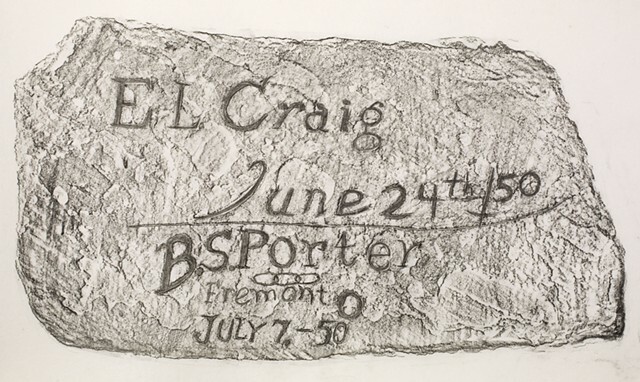 Ironically, the sandstone rocks were too fragile to make the rubbings, so they were completed at the National Historic Trails Interpretive Center in Casper, Wyoming, where replicas of the rocks are exhibited.